Digging through early biographies of the Wordsworth, M.E. Bellanca uncovers one by the poet’s nephew Christopher called Memoirs of William Wordsworth, published in 1851. It features, as she notes, heavy quotation (about 45 pgs) from Dorothy Wordsworth’s Grasmere and Scotland journals. So, it should be considered an early publication of Dorothy’s, refuting years of scholarship that had claimed that Wordsworth’s talented sister remained unpublished during her life. Except scholars made no such claim. I thought Really? Another Keats biography? I'd just finished Stanley Plumley's Posthumous Keats, and Daisy Hay's Young Romantics, and what with Jane Campion's "Bright Star" (Apparition LLC 2010), I felt the moss'd cottage trees bent with apples, the gourds all swollen, and hazel shells plumped, if you take my meaning. I liked all these, mind you (though Plumley's less after I saw him read from it without force or elaboration as part of the Seattle Arts and Lectures program). Plus, I've written a chapter about Keats in this book, and recently published another article about him here. 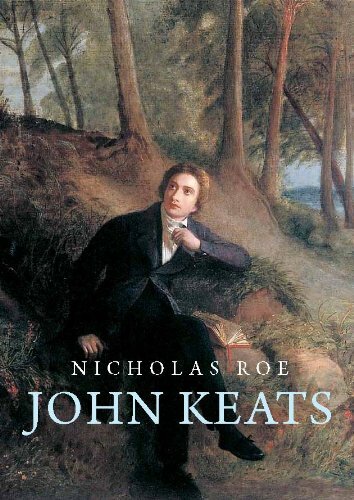 When I heard about Nicholas Roe's new Keats bio, I thought I would safely pass. But then I mentioned it to my friend Frederick Burwick, who claimed it on the spot "required reading." "No negotiating," he continued, "it's just stunning." And he was right--now that I've got my hands on it (thanks, SPU library for my pre-move copy, and Douglas County Libraries for my post-) I see just what he meant. I don't much appreciate the phrase "tour-de-force," since it is used indiscriminately to describe everything from blockbuster films to meals, but this book really is a tour of forcefulness: one never settles in, grows comfortable in the intellectual pressure. Three hundred pages in, it's still startling. There are also aspects of the Keats story that I never quite understood that this biography marks and lights. Keats is an aesthete: perhaps he is the aesthete (pre-Wilde, obviously). But Roe brings out just how political the work is, and was taken, in the poet's life, to be. He's no Shelley, but the choices of his friend group, his places of first publication, his identification with Leigh Hunt, even his grammar school marks him as a liberal, if not quite a radical. Everyone knows that Keats was a trained surgeon, but I hadn't processed fully a) how far along he was, and b) how much mileage he got out of medical vocabulary. No mere student of anatomy, according to Roe, Keats would've seen patients, removed limbs, dissected rotting corpses. The thought of that makes him less a wilting flower than he is often cast as. Moreover, his poetry becomes, as Roe shows, markedly more muscular (more sanguine, especially) during the period of his apprenticeship. Leigh Hunt is a giant. Now, he's an easy sort to make fun of: less talented than everyone around him, treated less well by history, and fawning. But during Keats' life, he was huge. As a cultural figure, and emblem of resistance, and a taste-maker, and especially as an idol for a young poet like Keats. Hunt published Keats' first poem, introduced him to others who would be seminal for his life and aesthetic, and guided his early work toward the epic and historical. We have much for which to thank Leigh Hunt, if not for his own work, then for much of Keats'. I'm not writing a full review, since I'm doing so much else just now, but for anyone who reads Romanticism, this is a second to Burwick's claim: Roe's book is required reading.